On this date in 1941, five weeks after the launch of Opera­tion Bar­ba­rossa, Nazi Ger­many’s sur­prise attack on the Soviet Union, Adolf Hitler paid a visit to the head­quarters of Army Group North. Army Group North had begun its first attack on Lenin­grad (present-day St. Peters­burg)—the Soviet Union’s second largest city—the month before, when it abruptly stopped some 60 miles south of the city. Hitler was furi­ous with Field Marshal Wil­helm von Leeb’s delay. Hitler once pri­vately described the no-nonsense prac­ticing Catho­lic as an “incor­rigible anti-Nazi” and placed him under Gesta­po sur­veil­lance. Never­the­less, Hitler valued Leeb’s mar­tial skills suffi­ciently to recall the gene­ral from retire­ment in 1939 for the inva­sion of Poland, and Leeb had led Army Group C during the inva­sion of France and the Low Coun­tries in 1940. Leeb’s army, now des­ignated Army Group North, was tasked with de­stroying Soviet forces in the Bal­tic States, and then driving on to Lenin­grad. Mili­tarily, Lenin­grad was prized because it lay across the path of the Ger­mans’ advance into the north of Russia. During his July visit to Army Group North Hitler ordered Leeb to take the city by Decem­ber. Six weeks later Leeb’s army had the city com­pletely encircled. With­in days Hitler reversed him­self and ordered Leeb not to take the city. Lenin­grad must be erased from the face of the earth by star­va­tion, Hitler told the troops later that month, not by full-scale assault; he had no inter­est in saving the lives of its civil­ian popu­la­tion. “Requests for su­rren­der resulting from the situ­a­tion of the city will be rejected, as the pro­blem of housing and feeding the popu­la­tion can­not and should not be solved by us.” Between Janu­ary 1942, the month Leeb was relieved of com­mand, and Janu­ary 1944, Soviet defenders launched seve­ral coun­ter­of­fen­sives, but the night­marish 900‑day siege of Lenin­grad—the longest siege in modern history—was only lifted on Janu­ary 27, 1944, in part because Wehr­macht mis­for­tunes else­where along the East­ern Front drained man­power and mate­riel from around Lenin­grad. 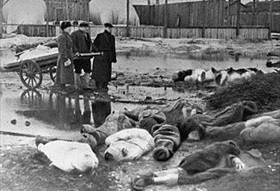 Some 2.5 mil­lion Lenin­graders endured the siege and a little less than half of them (1.1 to 1.3 mil­lion by the best esti­mates) died from the cease­less shelling and aerial bombing or were victims of star­va­tion, disease, and exposure to the brutal cold. 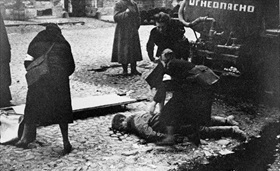 Left: Nurses help people wounded in the first bom­bard­ment of Lenin­grad, Septem­ber 10, 1941. Of the roughly 30,000 medi­cal doc­tors and 100,000 medi­cal nurses in pre-war Lenin­grad, less than a half survived the siege. 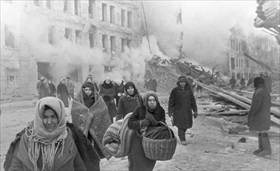 Right: Citizens of Leningrad leave their homes de­stroyed by Ger­man bombing, Decem­ber 10, 1942. Between June and Septem­ber 1942, Ger­mans sta­tioned newer, heavy artil­lery cap­able of firing 800 kg (1764 lb) shells 6–16 miles from the city. They made spe­cial maps of the city for artil­lery bom­bard­ments, tar­geting city infra­struc­ture, busi­nesses, trans­por­ta­tion, schools, and hos­pi­tals. Addi­tionally, hun­dreds of Luft­waffe bombers dropped incen­di­ary and high-explo­sive bombs on the city. During the horrific siege 3,200 resi­den­tial buildings, 9,000 wooden houses, and 840 fac­to­ries and plants were de­stroyed in Lenin­grad and sub­urbs, leaving the city a “ghost city” of thou­sands of ruined and abandoned buildings. Left: Leningraders struggled to stay alive and defend their city in the most appalling con­di­tions. They were bombed, shelled, starved, and frozen. They dug tank traps and trenches, built shel­ters and forti­fi­cations, fought fires, cleared rubble, tended the wounded, and, for as long as they had strength to do so, buried their dead. Many (3 per­cent) were killed by bombs or shells, but most (97 per­cent) died of hun­ger and cold. Here three men are seen burying victims of Lenin­grad’s siege, October 1, 1942. 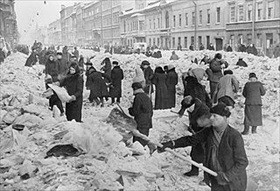 Right: This photo show citizens of Lenin­grad cleaning a street after the first win­ter in the besieged city, March 8, 1942. For the defense of the city and tena­city of the civil­ian sur­vi­vors of the siege, Lenin­grad was the first city in the former Soviet Union to be awarded the title of a Hero City in 1945. Left: On September 22, 1941, Hitler issued Directive No. 1601, ordering the star­va­tion of Lenin­grad’s defenders. 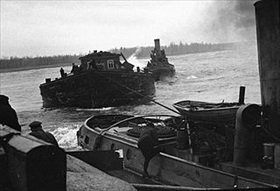 In May 1942 the Soviets began using boats on near­by Lake Ladoga to make food deli­veries to the star­ving sur­vi­vors. In Ger­many not much is said about the fate of war­time Lenin­grad. In the minds of most peo­ple, Stalin­grad, Dres­den, and Hiro­shima are considered the largest city dis­asters of the Second World War. How­ever, the siege of Lenin­grad caused the death of about twice as many civil­ians as died in Ger­many from Allied air attacks during the entire war. 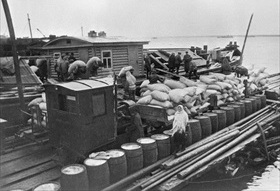 Right: Foodstuffs delivered to besieged Lenin­grad on a barge on Lake Ladoga, Septem­ber 1, 1942. Total civil­ian death toll in the second year of the siege was about 500,000 citi­zens. Janu­ary and Febru­ary 1942 were the dead­liest months of the siege; every month 130,000 civil­ians are found dead in Lenin­grad and its sub­urbs. Part of the civil­ian popu­la­tion was evac­u­ated from Lenin­grad, al­though many died in the pro­cess. Some were evac­u­ated to Siberia, where they died. Only 700,000 peo­ple were left alive out of a 3.5 mil­lion pre­war popu­la­tion. Among them were sol­diers, workers, sur­viving chil­dren, and women. Of the 700,000 sur­vivors, about 300,000 were sol­diers who came from other parts of the coun­try to help defend the besieged city. Land mines left by the Ger­mans caused thou­sands of deaths among returning citizens.